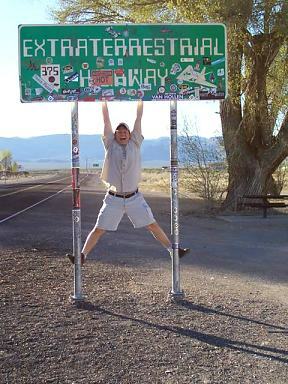 Editor's Disclaimer: Trespassing the Area 51 boundary is a crime, and may result in up to six months jail time and substantial fines. The report below is included here to warn others of the serious consequences. This is not a game, and we strongly discourage anyone from trying this on their own. Growing up in Pittsburgh PA, I've always been fascinated with Xfiles and the secrets kept by our government. Saturday March 12th around 3pm, I decided to grab my girlfriend and take a trip from my present home in Las Vegas to the famous "non existant" Area 51. I found the Extraterrestrial Highway without a problem and had a few snap shots taken. Around mile marker 32 (I think). Despite my girlfriends wishes, I drove off the highway, and proceeded down the extremely long dirt road. My heart racing, I knew I just had to see how close I could get!! About 10 minutes into the drive down the long dusty road, I could see dust from a vehicle coming my way. As we approached it, I noticed it was a truck coming toward me. All of a sudden, for no apparent reason, it stopped, turned around and quickly raced back to whence it came. I tried to catch up, but still, it was driving way too fast for my level of comfort. Finally, arriving at the famous WARNING signs, I stopped the car, and realized this was as far as I was gonna get. BUT...I couldn't easily turn the car around, and noticed right AFTER the sign, there was a mini hill that I THOUGHT I could drive up and turn around to get the hell outta there! My girlfriend protested, but in anycase, I thought, I'll just drive up there, turn around and leave peacefully. If only they had fences (like most 'keep out' areas) to keep idiots like me out! Well, curiosity killed the cat that day! After trying to drive up the hill, my car couldn't make it up for it was too steep. As I began to back down the hill, the truck that was sitting on the very top of the hill quickly began it's intercept course. I turned my head and made eye contact with the passenger of the unmarked truck. He raised a pointed angry finger and yelled "YOU! STOP THE VEHICLE!" Doing that, I quickly stopped as he yelled "PUT YOUR HANDS IN THE AIR" We both obeyed. An older gentleman walked over to my car and asked for my ID as his partner kept his M-16 steadily pointed at my girlfriend and I. They called in for someone for the base (I assume) because about 15 minutes later, another truck came in from the base. I couldn't hear what they had said, but we calmly stayed in the car until an hour went by and the Alamo Sheriff showed up. I tried explaining to them that all I wished to do was turn around, but the military man told me it didn't matter. I crossed the line, and now it is in the sheriffs hands. The Camou dudes did not speak much, but when they did, they were pleasant. I think it helped me for the fact that my girlfriend was with me. Finally, it was time for our release. The Camou dudes read a paper to us, basically stating my removal. Then the sheriff gave me a citation of $337.00 as well as the same to my girlfriend. He then escorted us back to Highway 375 (by then it was about 8:30pm, dark) and had me stop yet again to get our mug/snap shots of our faces. Again, the Sheriff was friendly in that he suggested I go to Rachel and tell my story. I must be few among idiots that have such a tale. A month later I tried to go to court to get my bail released, but was told by the district attorney in Alamo, that when dealing with Area 51 trespassors, there is no negotionations. So, yes, I paid the full price of $674.00. My suggestion to any, is that if you do want to get close, fine, but DON'T GET STUPID!! 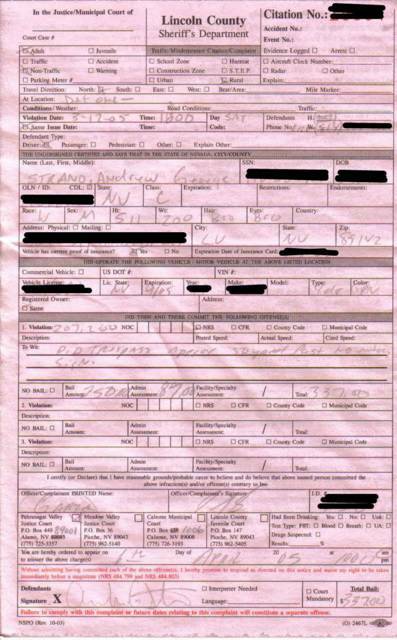 Editors note: Andy had to sign this (pink) citation, issued by the Lincoln County Sheriff's Department. 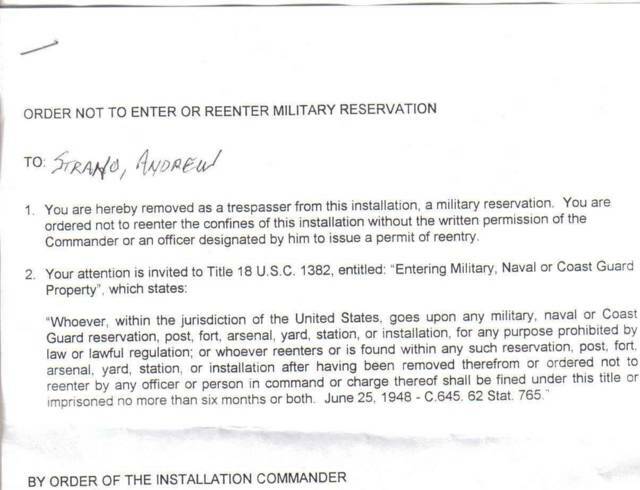 He was also issued the (white) "Order not to enter or reenter Military Reservation".